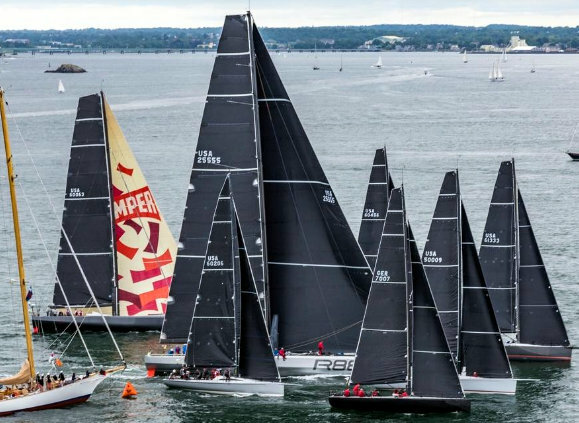 A light southeast wind and more than one knot of current flowing out of Narragansett Bay helped send the fleet of 169 boats in the 51st Newport Bermuda Race on their way. Only one boat among the 170 entries in the race failed to start: Araucaria, a 55-footer sailing in the Finisterre Division for amateur boats using cruising sails. Setting a pre-race course past Whitehawk, the 105-foot starting line boat, a misjudgment of the current resulted in a collision between the boats and the retirement of the smaller. During the starting sequence, a McCurdy & Rhodes 38-footer named Selkie came too close to Whitehawk, but after taking its penalty turns, Selkie was able to continue. Class 15 in the Gibbs Hill Lighthouse Division, a group of high-tech, high-speed, professionally crewed boats, the 88-foot Rambler 88, a former record holder for the Newport Bermuda course, started a little behind several smaller boats but made its way through the middle of the closely packed fleet. The race continues for the next three to six days, depending on the size of a boat and the strength of the winds between here and Bermuda. Currently, the forecast is for lighter winds.